While colic, sleep training, and picky eating have each left deep, emotional scars on my parental psyche, I was always pretty lucky in the separation anxiety department. My daughter didn’t bat an eyelash when I dropped her off at preschool for the very first time, and since I’m fortunate enough to work from home and have never had to worry about daycare and nanny options when one of us is sick or I have a pressing deadline, I just don’t think the idea of me not being around has ever crossed her mind. We have been living in the same condo since before my daughter was born, and while I love the convenience of underground parking lots, garbage chutes, and maintenance crews, fire alarms have always been an issue for us. They’re loud and scary and last for 30+ minutes at a time, and since they have a tendency of happening at 2 am when we’re all in a deep slumber, they have ruined more nights of sleep than I care to remember. The good news is that we have always been able to calm my daughter and get her back to sleep rather easily whenever they happen, but our luck ran out when we had 3 consecutive fire alarms at bedtime one night at the beginning of the school year. Our sleep-loving daughter was suddenly afraid to be in her room by herself, and after 2 straight weeks of crying myself to sleep on the hardwood floor of her bedroom, I knew something had to give. So I reached out to my village of mom friends for advice, and after a lot of perseverance, hard work, and compromises (bedroom door open, hall light on, and toys in bed), we managed to get back to a good place in the sleep department. And since a lot of the strategies we used were quite general and have helped countless others deal with various types of separation anxiety in kids, I decided to write them all down. As parents, we will do anything in our power to protect our kids from things that scare them, but experience has proven to me that even though avoidance lessens my daughter’s fears in the short term, it actually makes her anxiety worse over time. Of course, this doesn’t mean I’m not compassionate and that I don’t empathize with her fears. I just don’t let them take over her life. The best analogy I can think of is teaching a kid how to ride a bike. If they fall down and scrape their knee, we clean them up, put a bandaid on, give them a hug, and dry their tears, but rather than allowing them to put their bike in the garage and never ride it again, we encourage them to get straight back on it because we know the sooner they face their fears, the better. Well, the same applies with separation anxiety. If your child is afraid of leaving your side, the best thing you can do for him is to expose him to that fear so he not only sees you are going to come back, but also recognizes it’s not as scary as he thinks it’s going to be. When my daughter was going through nighttime separation anxiety, our bedtime routine went from a quick 5-minute exercise to a 45+ minute nightmare, which meant she was going to bed later than normal, feeling less rested, and waking up more frequently as a result. It was a vicious cycle that left me feeling tense and stressed and irritable, which escalated the situation even more, but once I started planning ahead (taking care of all nighttime chores during the day, starting the bedtime routine an hour early, and taking catnaps where I could), I found I was better equipped to deal with my daughter’s protests and tantrums. One of my biggest fails as a parent is my tendency to overreact to things. If my daughter falls, I instinctively yell, “OMG, are you okay? !” before she even has time to register what happened, which inevitably leads to a crying jag that likely wouldn’t occur if I could just kept my big mouth shut. Of course, recognizing this little problem of mine is one thing; learning how to deal with it is something else entirely. But with time and practice (and a lot of deep breathing), I’m getting much better at not reacting to things until I need to, and I found this technique especially helpful when my daughter was struggling with separation anxiety at night. Rather than lingering in her bedroom and humoring her pleas for one more drink/book/kiss/hug, I remained calm, told her I loved her, and left the room. It took some practice and getting used to, and there were many nights when I wanted to go into her room, grab her from her bed, and hold her tight, but I found that the less I interfered and the more I kept my emotions in check, the easier it was for her to get over her fear. If I have learned anything in the last 4+ years of motherhood, it’s the importance of being consistent. Yes, it’s nice to make exceptions now and then, but the more consistent you are, the more your child will know what to expect. Now, I realize we need to be compassionate, and when your little one is screaming her head off at school drop off because she cannot bear the idea of you leaving her there, it’s okay to offer extra hugs and kisses to try and calm her down. But remember that each time you deviate from your normal routine, you not only confuse your child, but you also give up control of the situation. So give her a hug, tell her you love her, and remind her that you will be back very soon. While all of these strategies are helpful when dealing with separation anxiety, one of the most important things you can do for your child is to follow through on any promises you make to her. Sure, it’s tempting to promise the entire world when you’re late for a meeting with your boss and your daughter is clinging to your legs, but the trick here is to establish trust in your child. Credibility is key, so if you say you’ll pick her up at 4 pm and take her for an ice cream, make sure to do exactly that! 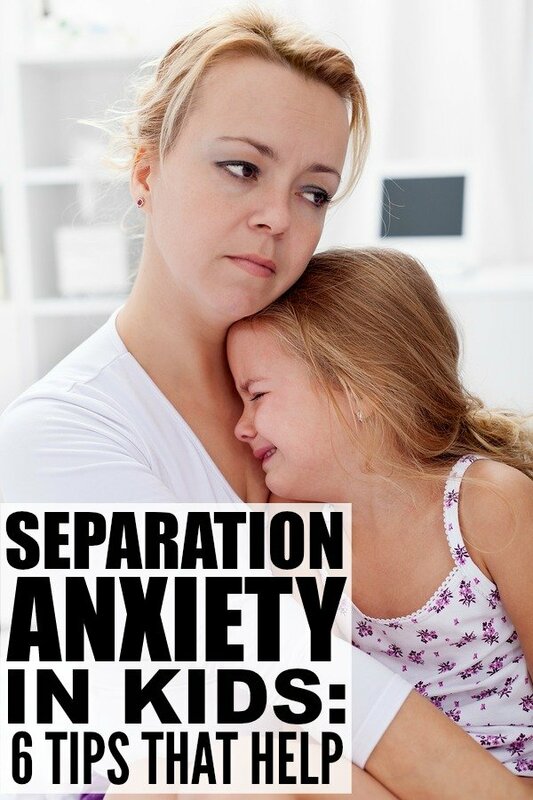 Separation anxiety isn’t fun for anyone, but it can be particularly hard on the parent or caregiver the child wants to cling to 24/7. Yes, it is likely just a phase, and I’ve never heard of a child taking mom or dad to college with them, but when you’re functioning on next to no sleep and can’t spend 5 minutes alone in the bathroom without your little one screaming at the top of his lungs for fear you’ll never return, it can be downright frustrating. The only problem is that, the more you show your frustration and irritation, the more insecure your child will feel. So take a couple of deep breaths, give your child a warm smile, and remember: this too shall pass. If you found these tips for coping with separation anxiety in kids helpful, please share them on Pinterest! And if you’re looking for more parenting tips and tricks, please follow our Parenting board where we share all kinds of great ideas and finds!